Asics’ marketing pitch: Run longer, and with greater efficiency. Upper: Spacer mesh, no-sew synthetic. Midsole: Dual-density compression molded EVA foam, Gel pads, plastic midfoot shank. 10 mm heel drop. 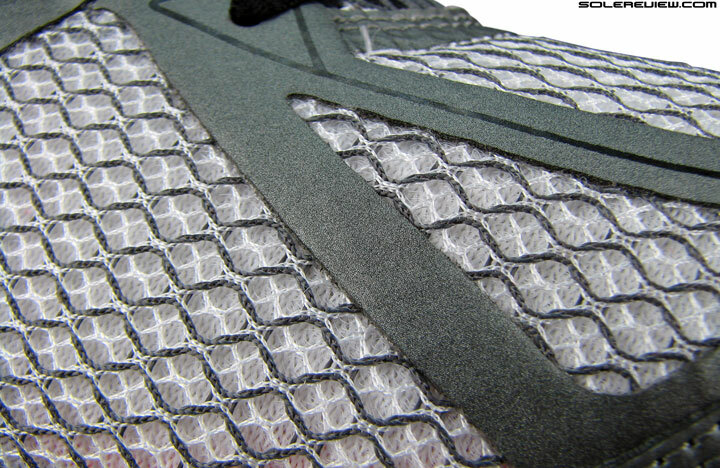 Outsole: Soft blown rubber under forefoot, harder carbon rubber under heel. Not much newness to see here. 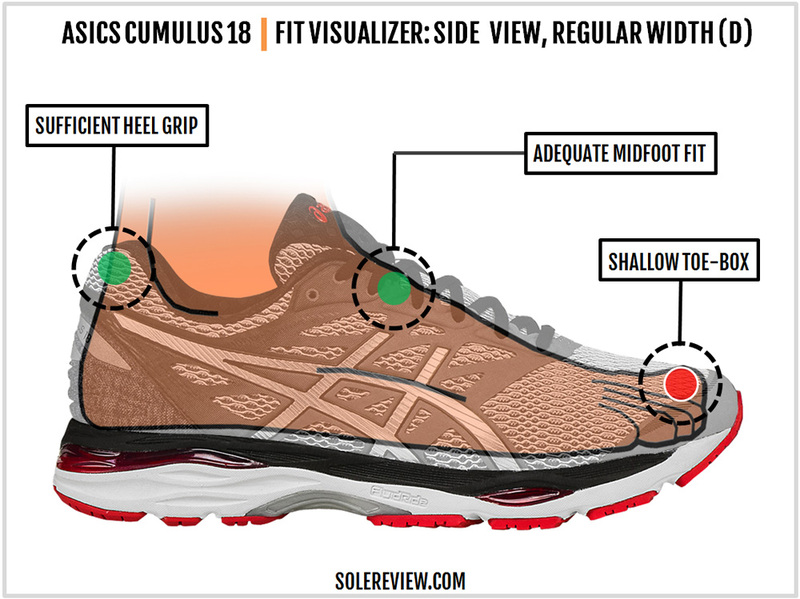 Very similar ride quality to the Cumulus 17, and watch out for the shallow and pointy toe-box. Half size up for best results. This is one of those updates where the shoe takes a couple of steps backward and none forward. What is it with Asics and running shoe toe-boxes? 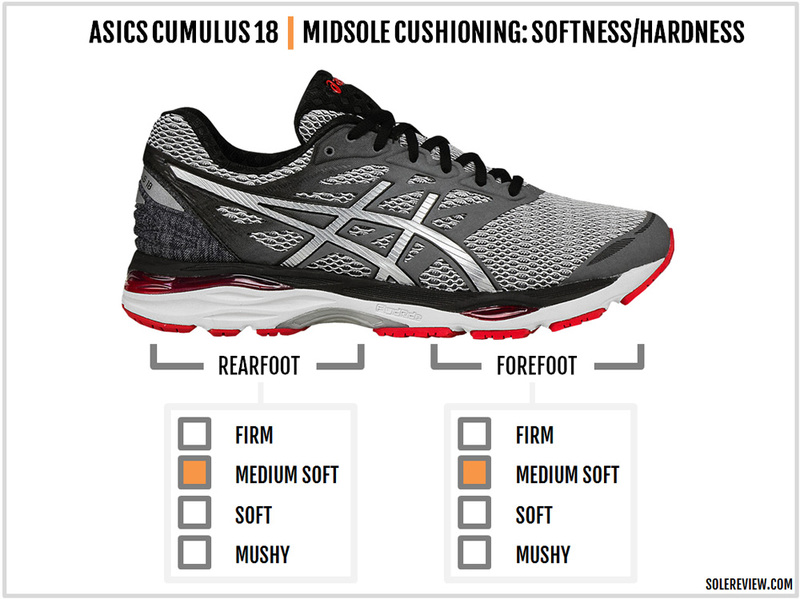 They recently squished the toe-boxes of the Kayano and the Nimbus, and now it’s the turn of the Cumulus 18. It’s a pity, because barring the shallow and pointed toe area, the Cumulus 18 is actually a well-rounded shoe. 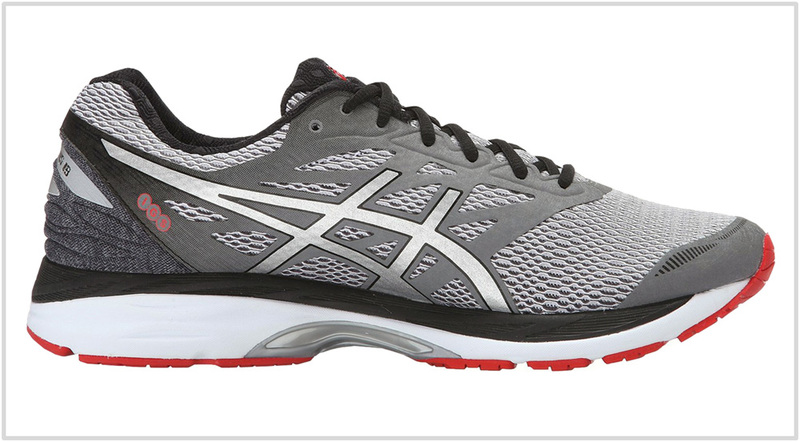 It has long been Asics’ neutral cushioning staple, priced below the softer Nimbus. Not everyone wants a super soft shoe like the Nimbus. The Cumulus hits the sweet spot of ride quality by being neither too soft nor too firm. While the typical Cumulus upper lacks the premium plushness of the Nimbus, there is usually little else to complain about. This year is a different story. If you’ve been a Cumulus 16 or 17 customer in the past, then the 18 will provide little reason for cheer. 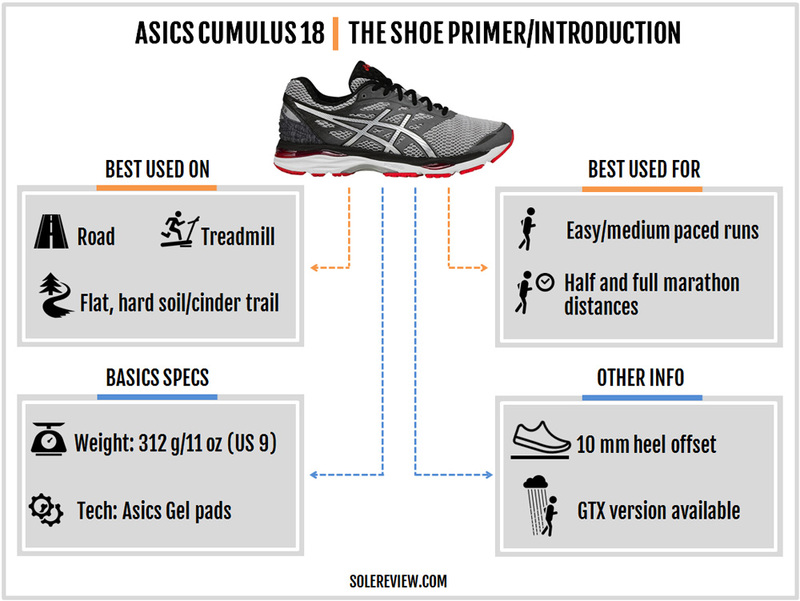 The Cumulus 18 competes with the likes of the adidas Glide Boost, the Nike Pegasus, and the Saucony Ride, among others. By today’s standards, the $110-130 price range is classified as mid-priced, which makes this product segment rather crowded. But look at the bright side. It takes some work to sift through the clutter, but if you know what you’re looking for, then having multiple choices is a good problem to have. Let’s say you’re in the market for a responsive and supportive neutral. In that case, the adidas Glide Boost and Saucony Ride 9 would be up for the task. The Ghost 9 and Underarmour Gemini 2 might not be very soft, but they happen to be extremely supportive neutrals. The updated Pegasus 33 is both soft and responsive, the result of a midsole now equipped with dual Zoom Air units. If you want to stick to Asics and are okay with a softer ride and a heftier price tag, then the Nimbus 18 is the shoe to get. Asics being the brand it is, radical design change is an uncommon occurrence. The visual scheme of the Cumulus 18 bears a close resemblance to the 17; the upper is a mix of fused and stitched synthetic over a traditional spacer mesh base. Materials used on the heel collar and tongue have been borrowed from the Cumulus 17, in addition to the midfoot design which fuses no-sew layers over the upper. The tongue comes without an inner sleeve, just like the last year’s C-17. The heel design is a nod to the Cumulus 16 and is visually cleaner due to the absence of synthetic layering. The amount of reflective trim gets an upgrade, and the Cumulus 18 now sports two prominent strips over the heel. The design sameness doesn’t apply to the forefoot and the toe box, however. Whereas the Cumulus 17’s forefoot was generously covered with synthetic support structures, the newest Cumulus’s forefoot is all mesh. And the toe-box has a completely different design. Instead of the combining fused urethane with a stitched-over bumper like on the C-17, the Cumulus 18’s toe-bumper is constructed using a one-piece synthetic. The toe-bumper update has implications for the quality of upper fit. Scroll down to the upper fit and feel section to learn more. The midsole set-up is the same old, except for a few changes. The Cumulus 18 continues to rely on the dual-density EVA foam stack while making a few updates to its visible Gel area. 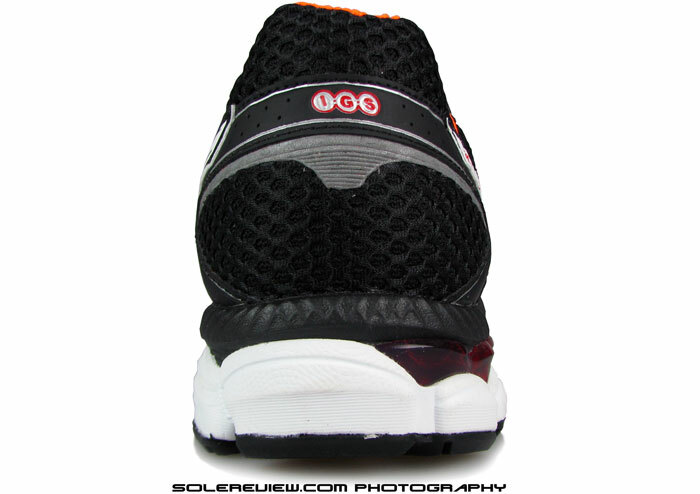 Under the rearfoot, the Gel windows shrink in size on the side but increase right under the heel edge. 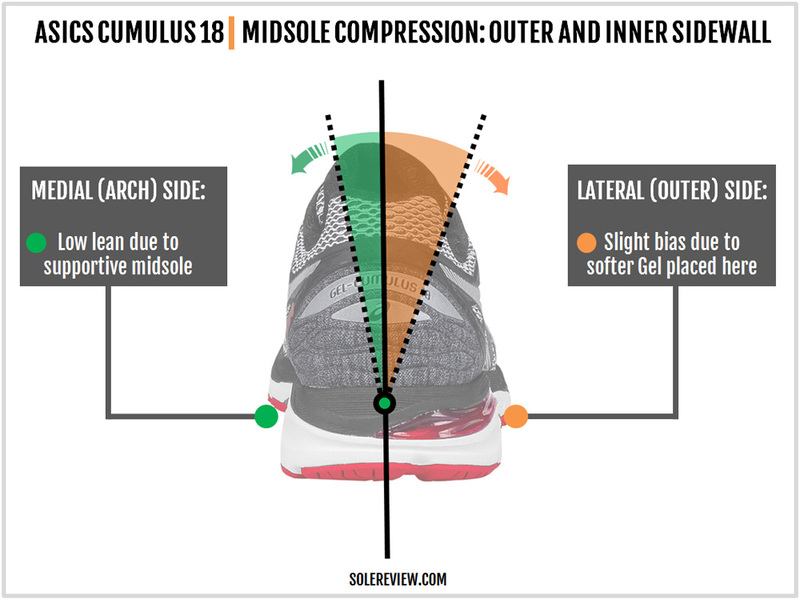 The Gel extends further towards the medial (inner) side than the Cumulus 17, just like how the Kayano 23 has done it. 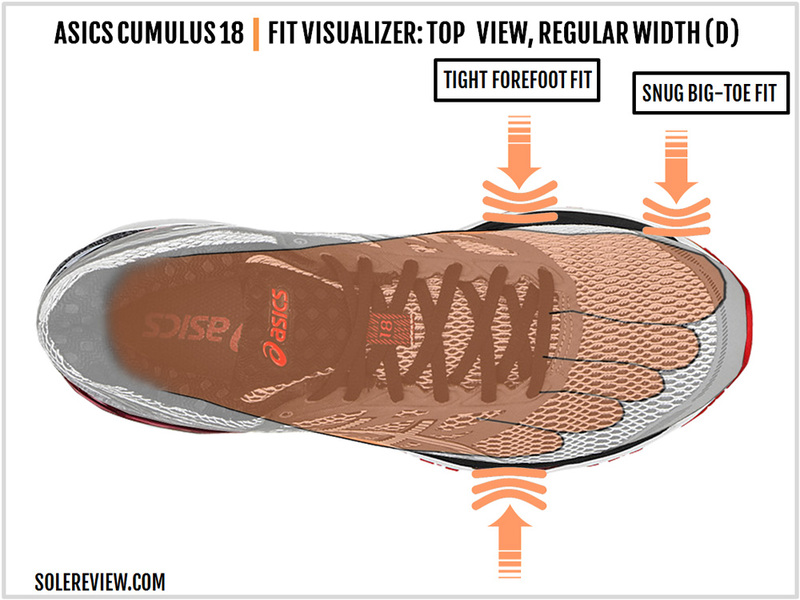 The outsole design retains the Cumulus 17’s layout while making a couple of tweaks. 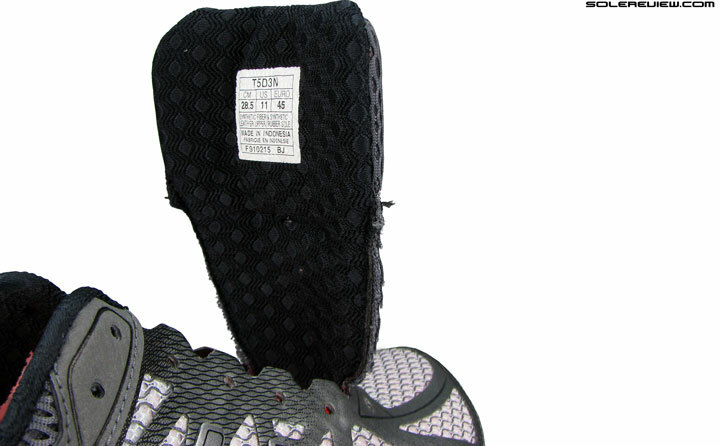 The design of the plastic shank has been modified slightly, and the exposed midsole foam between the rubber slabs is lower to the ground versus the C-17. On the last year’s Cumulus, the rubber pieces were mounted on raised foam pods. The Cumulus 18 tones that down, and the rubber outsole is now glued to a lower profile midsole. From a durability standpoint, the Cumulus 18 puts check-marks in most boxes except for the toe-box. Given the newly acquired shallowness and pointy shape, the unsupported mesh over the big toe is a potential weak spot. Though it would depend on individual foot anatomy and running style, the fragile toe-box is an area to watch. We do remember the Kayano 20 to have had the exact issue, and Asics later put in a fabric backer inside the Kayano 21 to make it stronger from within. The Cumulus 18 has no such reinforcement, and the upper mesh has neither synthetic overlays (like the 17) nor an inner lining protecting it. Keeping in line with the design changes on the upper, the Cumulus 18’s fit closely matches the Cumulus 17 except for the toe-box. The narrowly molded heel counter is very snug, and the midfoot wraps with medium fit intensity. The toe-box height is cut down vertically. 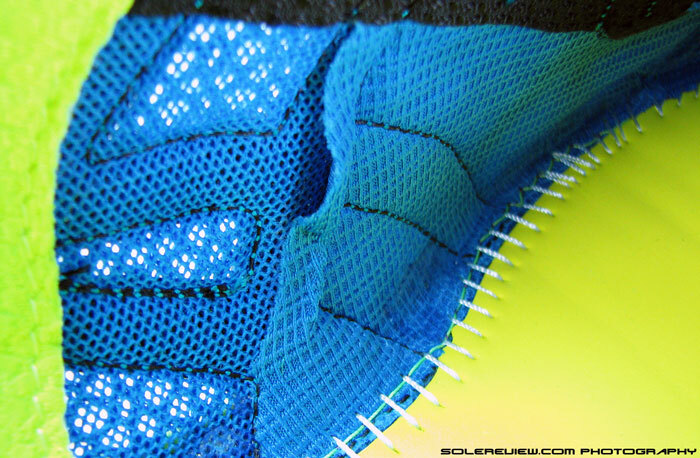 This means that for most runners, the big-toe is going to stick through the mesh. Unless you half size up, which by the way, is a necessity on the Cumulus 18. 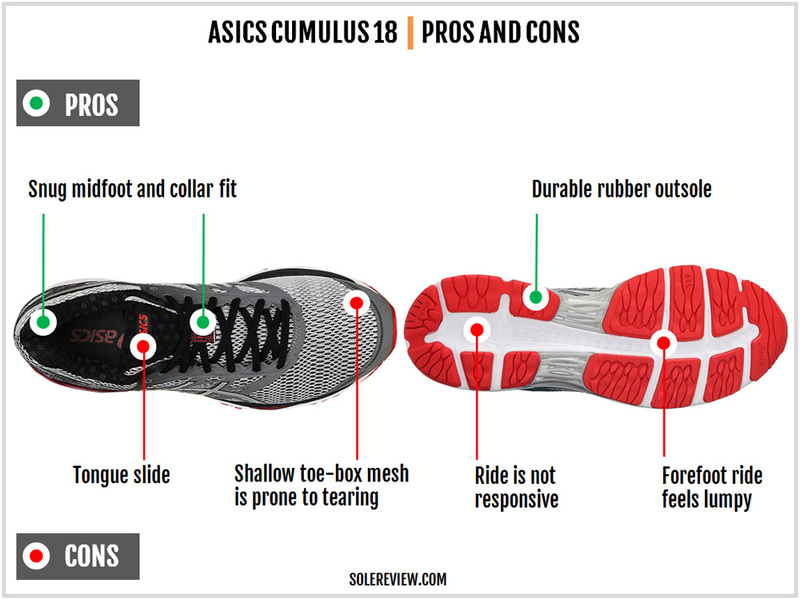 If you wear a US 9 in the Cumulus 17, you’d need to go a US 9.5 in the Cumulus 18. That’s thanks to the pointed and snub-nosed toe-box which will hem in your toes if you don’t size up. 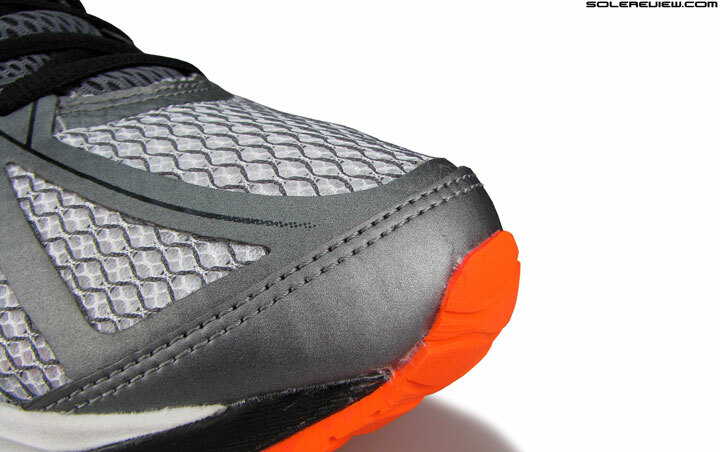 In what appears to be a counter-intuitive effect, the lack of overlays does not make the forefoot fit wider. The fused toe bumper is the culprit here. 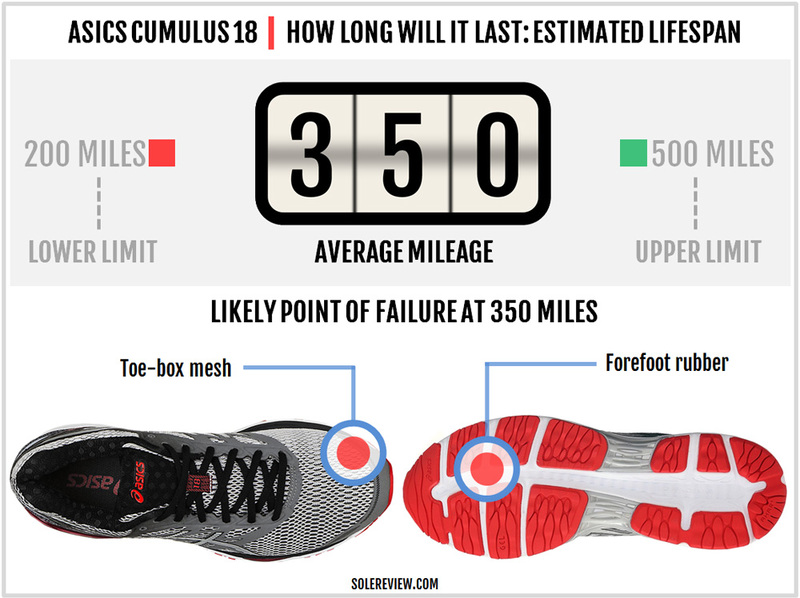 Not only does it flatten the top of the shoe, but also extends longer towards the forefoot than the Cumulus 17’s bumper. So when you have a piece of synthetic where there was mesh before, the fit turns tighter. A good way to put this is that the 2E (wide) width of the Cumulus 18 is like the D (regular width) of the Cumulus 17. 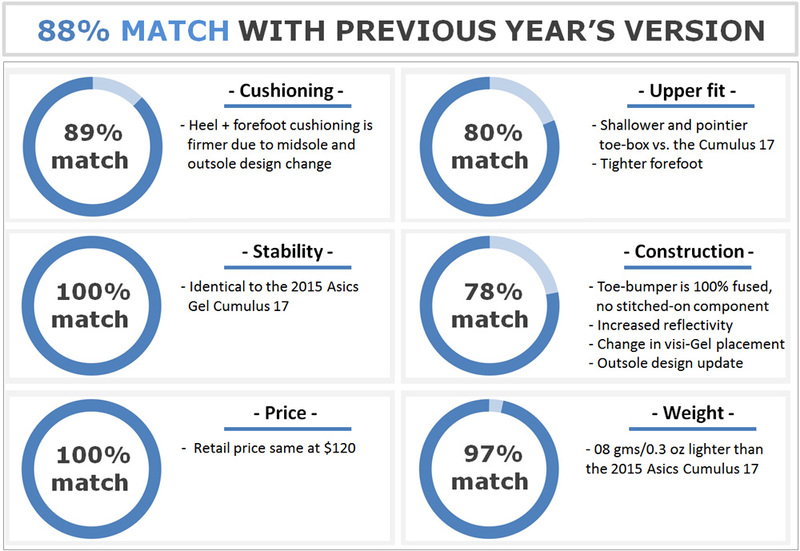 This shift in fit quality makes the Cumulus 18 a tricky shoe to buy. 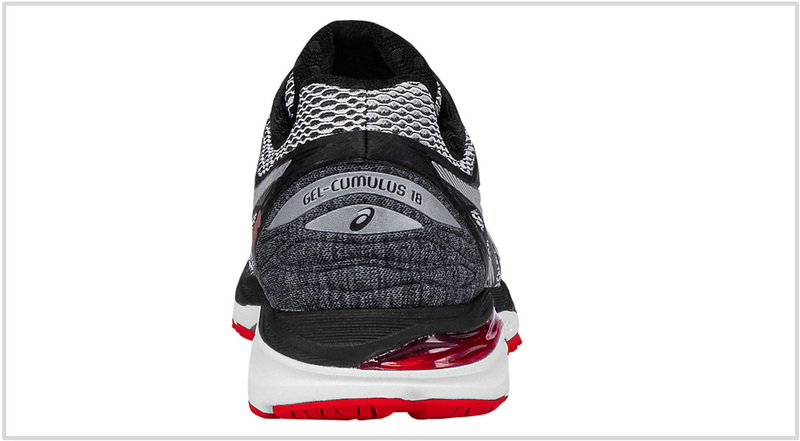 Do note that the Cumulus also comes in a GTX (Gore-Tex) version, which will only make the upper tighter. And if you’re planning to use the GTX version in a colder climate, then the thick running socks would also need to be taken into account. Yes, it’s complicated. And why does solereview keep ranting about the lack of a wide toe box? Does it even matter? Yes, it does, and that’s because of two factors. Feet tend to swell when running longer distances, so a properly shaped toe box helps accommodate the change in volume. Secondly, an anatomically correct upper fit helps push-offs. When the big toe is pinned down on top and from the sides, then it’s efficacy as a propulsion tool is compromised. A roomy toe-box isn’t a vanity requirement – it is a functional imperative. The Cumulus 18 maintains its soft ride character, though there are a couple of updates which affect the softness. The visible gel pads have been reduced in size under the rearfoot side, and also relocates upwards. This makes the rearfoot ride a bit firmer. 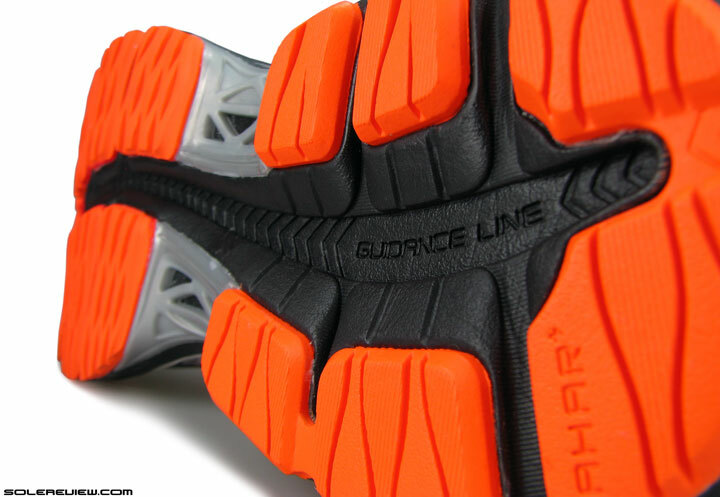 The lower-to-the-ground foam between the outsole rubber slabs increases firmness. The Cumulus 17’s outsole mounted on raised foam produced a ‘piston’ effect, a behavior which is toned down on the C-18. 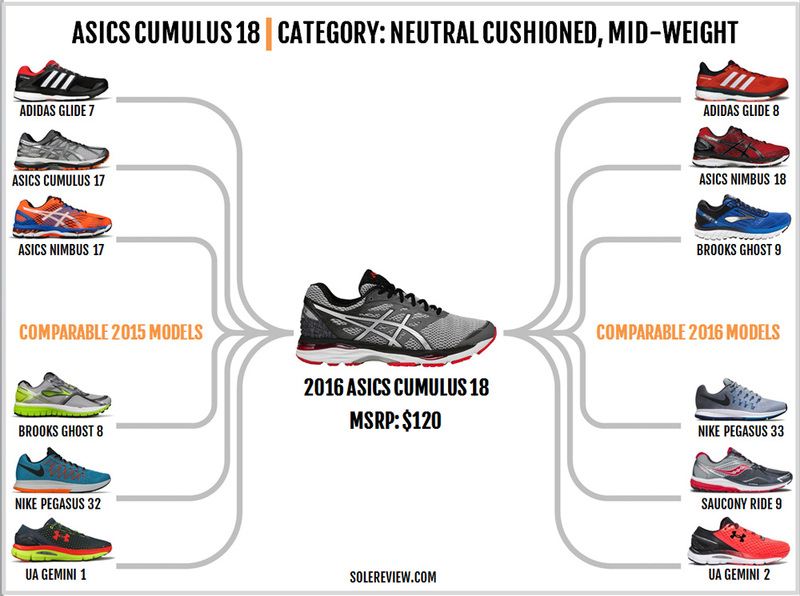 In a way, the Cumulus 18’s softness is a closer match with the Cumulus 16 than the outgoing 17. 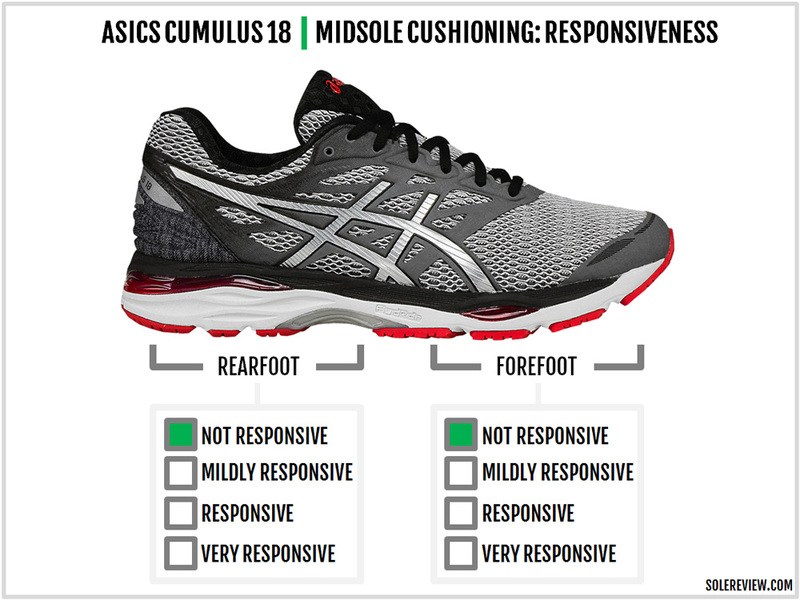 Midsole responsiveness is typical Asics, which simply means that the ride isn’t responsive. If you ask us, the Cumulus 17 was more responsive than the 18. Not due to the material, but because of the way the outsole was stuck to the raised foam pods. The kind of foam material which Asics uses has never been responsive. Even the pricier Nimbus isn’t more responsive, just softer. The new Dynaflyte material used in recent models has a slight rebound quality, yet a far cry from industry gold standards such as the adidas Boost. The Cumulus is one of those neutral shoes with a softer outer side, so there’s a hint of lateral midsole bias. The ride is still supportive, and you have none of the sideways roll which comes with (other) mushy shoes. Transitions feel closer to the ground because of lowered midsole. The forefoot feel is quintessential Asics; it feels a bit lumpy due to the wide, exposed foam groove running right through the center. 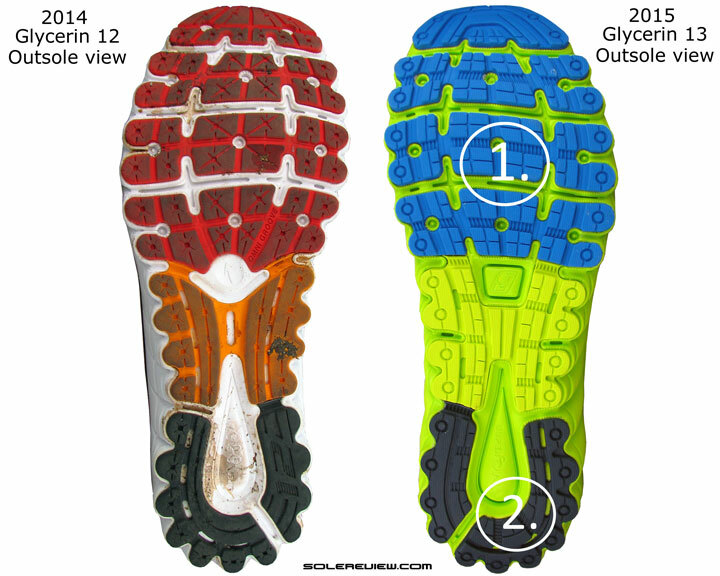 If you ask solereview, unbroken side-to-side strips of rubber work way better under the forefoot. For the most part, the infographic is self-explanatory, so we won’t go into describing every pro and con. The only area of concern is the updated toe-box which cuts down on room both vertically and across. Besides the fit lacuna, the mesh above it is the weak link in the chain. 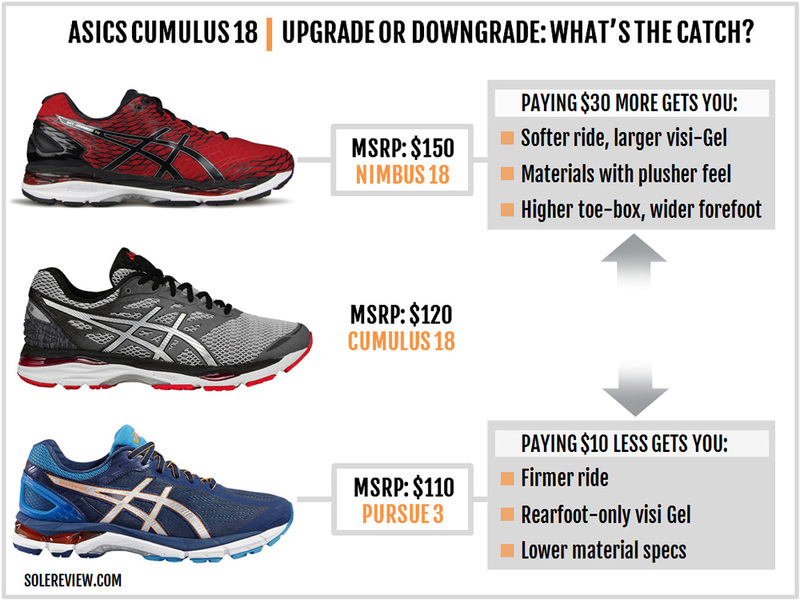 If you’ve bought the Cumulus 18, you’ve probably done so to get a soft riding shoe. You can plush up your shoe rotation further with the Nimbus 18, which has a softer ride and a better fitting upper. 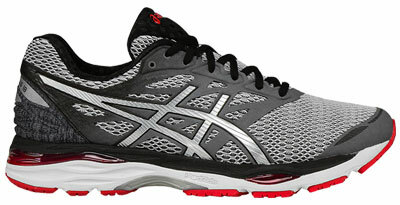 The Cumulus and Nimbus don’t make the grade as ‘fast’ shoes, so the Asics Dynaflyte fills that slot perfectly well. It’s got a firmer and more responsive ride, and yet the shoe is padded enough. The Nike Vomero 11 delivers a great mix of soft and responsive. 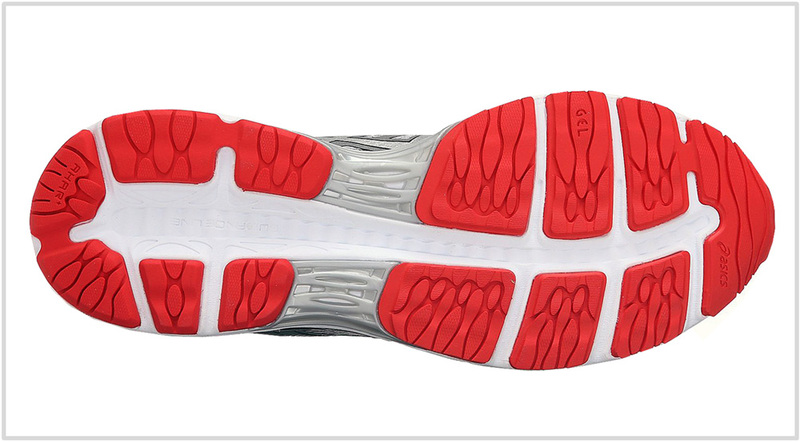 The midsole foam is soft, and the embedded Zoom Air bags balances the ride with firmness. The adidas Boston Boost is a perennial favorite when it comes to a shoe which feels light and fast, and yet has enough cushioning for miles to come. The Cumulus 18 has a few updates here and there, but fails to make a compelling case for itself as a Cumulus 17 upgrade. 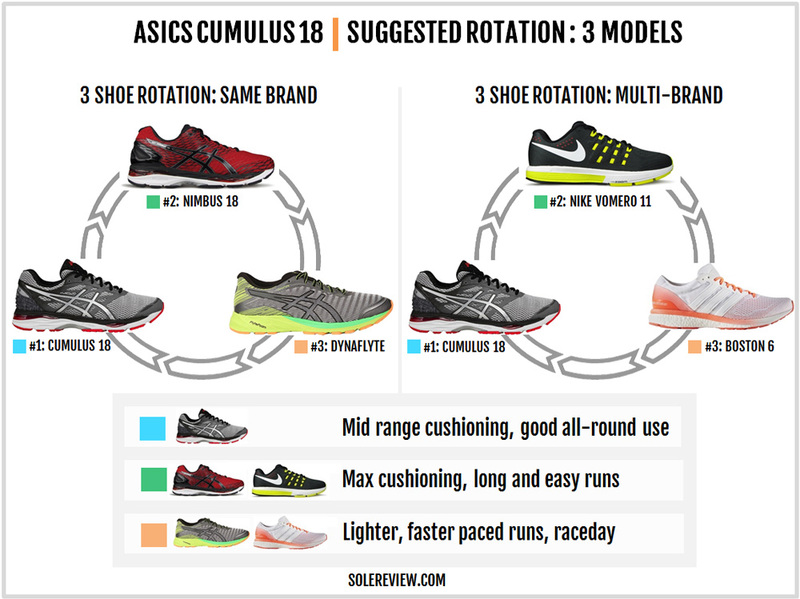 The uncomfortable toe-box is the low point of this year’s model refresh, and besides, what can the Cumulus 18 do which the Cumulus 17 can’t? The answer is – nothing. So, if you find a Cumulus 16 or 17 for less, then grab those instead. The upgrade logic here is fairly straightforward. Pay more money, get more midsole cushioning and upper plushness. Pay less money, and the reverse happens. Spending an additional $30 gets you the Nimbus 18, soft ride and all. Slightly closer to the $100 price point is the Gel Pursue 3, a firmer shoe with heel-only visible-Gel. But hey, the cheaper Gel Pursue 3 has a plastic heel counter like the Nimbus 18, but the Cumulus doesn’t. What’s up with that?